Last week marked a milestone day in the history of Ireland’s road infrastructure. 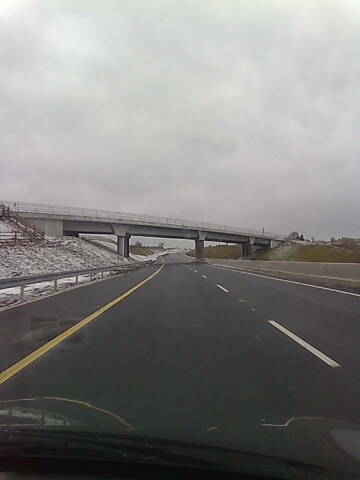 The last section of the M7 opened, between the towns of Nenagh and Castletown. This final section of link motorway is 36km long and it cost 365 million euro to build. The total length of this completed motorway is 195 km. As a result, apart from one signal controlled traffic junction (Newlands Cross), ever major city in Ireland is linked to the capital, Dublin, with either a motorway or high quality duel carriageway. The Helpful Engineer travelled on the completed road yesterday and below are two photographs. The heavy snow in the East of the Country was not present on the new road and driving conditions were easy. It was a pity that due to the extreme cold weather, last week, the opening ceremony was called off, as this is something to really celebrate. The map below shows Irelands motorway network, the only motorway shown which is not completed, is the lightly trafficked M18, Limerick to Galway route; this is 50% complete at present, and work is due to start on the remaining section in 2011. 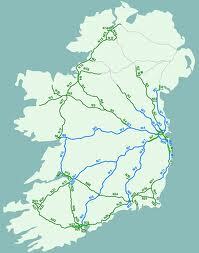 For an interactive map of Ireland’s motorway network click here . Ireland was very late to start building motorways. 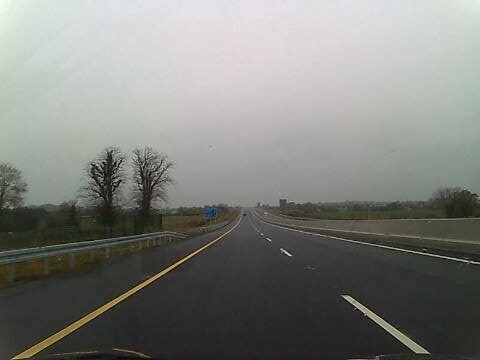 The first duel carriageway opened on the N7, between Naas and Dublin in 1968, it was 30km long. 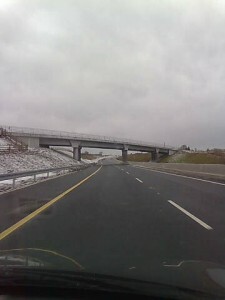 After that Ireland’s first short section of motorway opened in 1983, again close to Naas. The first motorway was called the M7, as it was on the N7 route, but due to its short length drivers could have been forgiven for thinking this referred to the number of minutes it took to travel along it. This typified the first years of motorway construction in Ireland with very short lengths of road being built to bypass particular towns. Each successive section of motorway built became known by the town it by-passed rather than the national route name. It was only in the last fifteen years that motorways were constructed on a large scale in Ireland with the aid of EU funding, public private partnerships and government funding. Ireland now has approx 900 km of high class modern motorways, and this means that per head of population it now has approx. 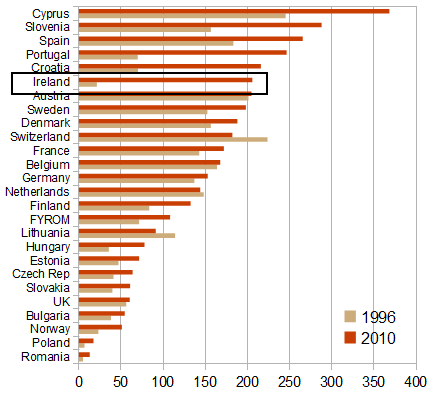 200km of motorway per million inhabitants; in 1996 it was around 20 km/million. Ireland has the 6th highest level of motorways per inhabitant in the European Union. Outside of the EU, for comparison, the US has 245 km of freeway per million people. See chart below. The motorways have transformed Ireland and made travelling much easier, faster and safer. This is particularly evident during the current weather as the motorways are relatively easy to drive compared with the old national roads with steeper gradients and tight corners. Now that the motorway network is more or less complete the National Roads Authority needs to concentrate on building service stations at close intervals on the system and linking the motorways together with short sections of motorway. The remaining routes that need to be upgraded to motorway are the already mentioned M18, complete the M11 to Rosslare Europort, connect Cork to Limerick M20 and a second outer orbital motorway around Dublin. The very first stretch of Dual carriageway was a narrow 1km affair between White’s Cross and Foxrock chruch on the N11, built in the 1950’s. People used to get the bus out there just to get a look at it!